Authors’ Note: Increasingly these days, there is a certain amount of controversy about the application of concrete scientific theories to works of fiction. It’s a curious development. We don’t claim to be scientists and we aren’t saying that anyone associated with the creative development of The Return sought to literally explain the events of the series in the light of strict quantum mechanics. But we also don’t see any reason why mixing soft and hard sciences should be seen as a negative thing. 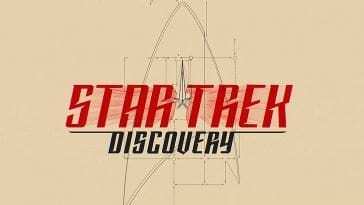 If you walk away from this article disagreeing with us, we will still be happy that you stopped by, and if you learned something new, about the show or quantum physics, we’ll be thrilled! 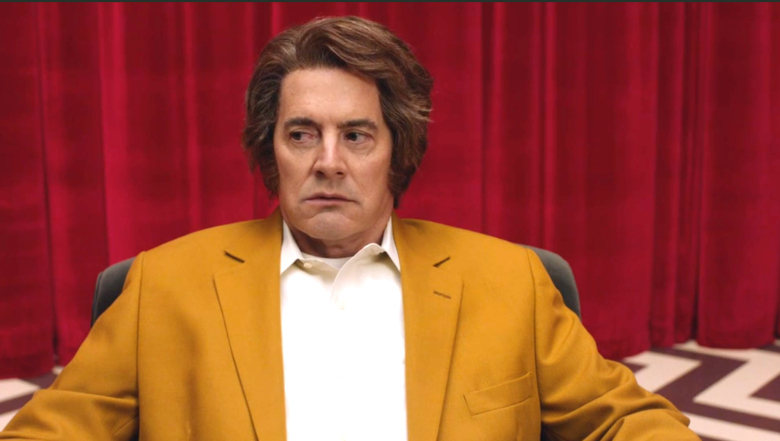 But in the end, this is intended as a fun exercise in exploring Lynch’s well-documented interest in modern physics, maybe shedding some theoretical light on the mysteries of Twin Peaks in the process. Earlier this week, Eileen and I took a hard and often tricky look at the Copenhagen Interpretation of quantum physics in order to try and use it to explain The Return. Whether we were successful or not is not the point; we just hoped that we could spur conversation and debate, which we did. But Copenhagen isn’t the only explanation available. 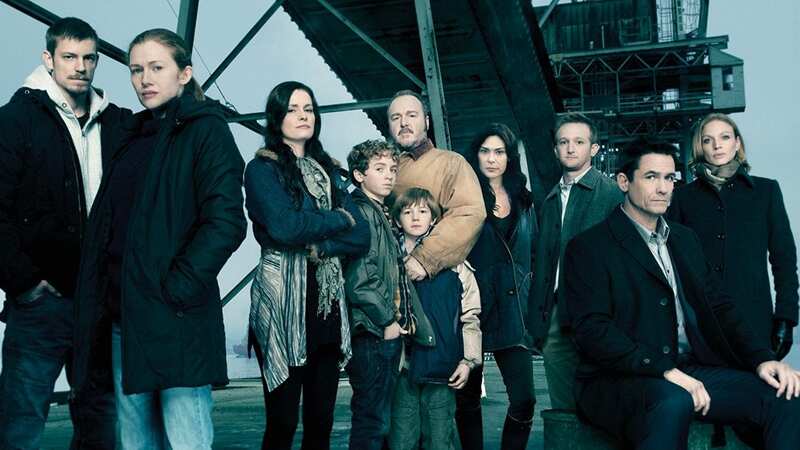 Among the most commonly accepted, of which Copenhagen is one, is the Many World Interpretation. Many Worlds (MW) sprang up as a response to the absurdities of Copenhagen. Early quantum physicist Erwin Schrödinger thought it was ridiculous for the quantum state of a given object to be expressed as both a wave and a particle simultaneously. His famous thought experiment—known as Schrödinger’s Cat—sought to illustrate this on a macro level in order to highlight how absurd it is. Schrödinger’s Cat is one, fairly famous way of looking at how MW functions. MW, as the name suggests, posits that our lived and experienced reality is but one of many that happen to coexist side by side. Like Copenhagen, the act of measurement is vital, but unlike Copenhagen—which, you’ll remember, posits that the probability of multiple paths exists but they cease to exist at the moment of observation/measurement, thus creating only one path of causality—MW says that each of those probabilities aren’t just probabilities but actualities. Measurement or observation doesn’t force a collapse of the wave function into one path but rather causes a split into as many universes are necessary to accommodate all possible outcomes. Each of these universes actually exist and are fully developed, fully realized world on their own, totally separate from one another. Parallel worlds, if you will. This has tremendous implications. Each of us individually makes millions and millions of choices in our lives. If each of those choices represents a split in the universe, then every action/non-action we take that constitutes a choice leads to a brand new universe springing into reality. Trying to imagine that is…astounding. MW was first posited by Hugh Everett in the 1950s but much of what he proposed was ignored until the 1990s, when other physicists came up with new thought experiments to try and prove MW. One of the most successful was the Quantum Suicide theory.  How Stuff Works podcast about Quantum Suicide is definitely worth a listen if you would like more information about this subject. MW has a lot going for it, but one of the more disturbing things about it is that it rewrites our relationship with time, marking it as non-linear instead of a straightforward series of progressions from one event to another. Sure, in each branch of this quantum tree that is growing with each choice we make/don’t make, there is a path of causality that can be followed. But since each other path that we haven’t taken has also produced its own paths of causality, over and over and over again, it complicates the idea of time unfolding neatly along the course of one’s life, or indeed on grander scales such as that of human history. Maybe what we saw earlier happened later than we thought it did? 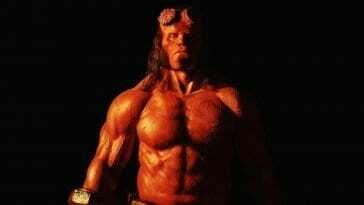 How do we reconstruct the passage of time? If the multiverse is real, how do we even know that what we’re seeing is from this reality or from one adjacent to it, equally real but born from a different set of choices and circumstances and causalities? What’s the point of all this anyway? 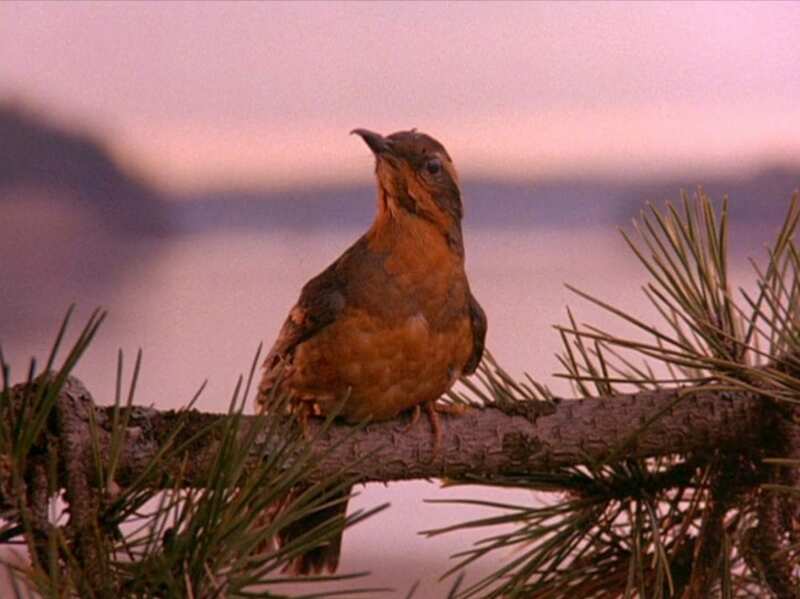 Many Worlds in Twin Peaks? Let’s apply this to The Return. 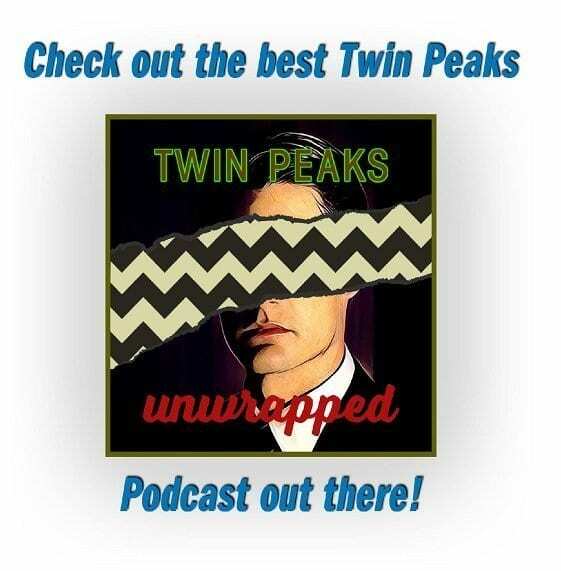 If MW is correct and the universe of Twin Peaks has been steadily diverging as choices have been made but that each divergence produces other paths that are all equally real and equally valid, this could go a long way toward explaining that diner scene. In the MW interpretation, the worlds created by each divergence run parallel to one another and don’t interact with one another; they’re wholly separate entities. Taking the scene from Part 7 into account, what do we see? First, we see the counter at the Double R as seen from the back left corner of the diner. Shelly is behind the counter serving coffee while Heidi takes an order on the left of our screen. 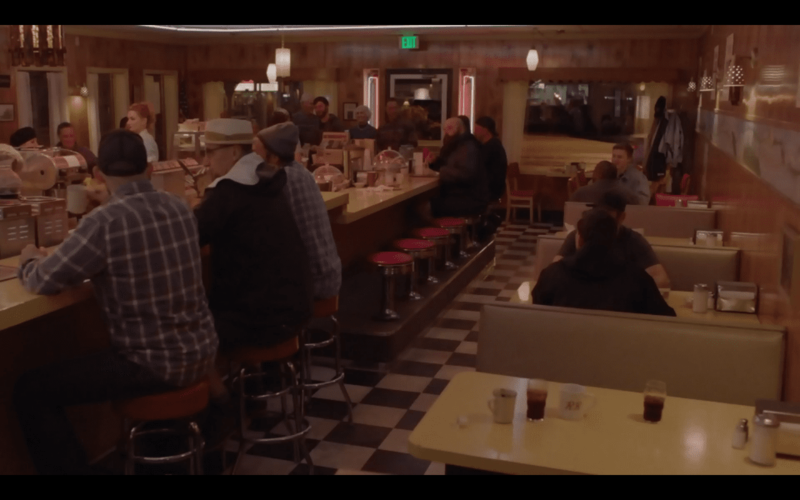 There’s a man in a patterned sweater at the bar, four people enjoying conversation sitting next to him further down, one of them a woman wearing a black hat; a young girl sips a milkshake in the booth near Heidi; a man in a brown zip up sweater with a beard sits on the opposite side of the central counter, and two women sit a few seats down from him, nearest the door. 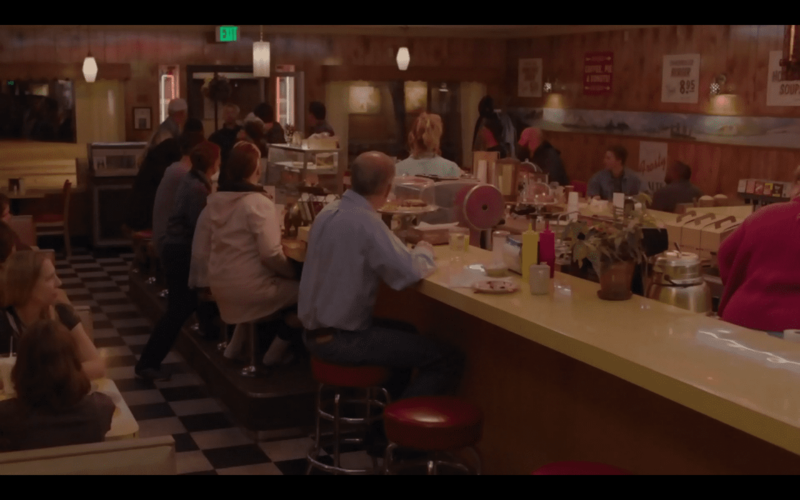 The camera cuts to the opposite corner of the diner but when it does, the scene has abruptly changed. The man with the beard is no longer sitting on his stool but is at the far end of the counter; the two women are gone, replaced by two burly looking men. Foregrounding the shot are three men—two in plaid and one in a black coat—conversing amongst themselves, while two men in black sit still in a middle booth along the right wall. A man bursts in asking if anyone has seen Billy but no one answers him. 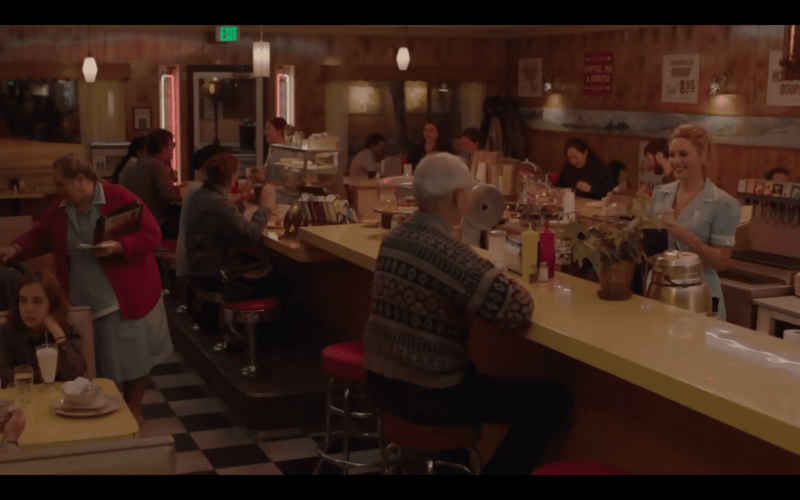 We cut to a shot of Norma and her bookkeeping, and then the camera shifts back to the original shot, and we see the two burly men on the opposite side of the counter; the milkshake girl, the man in the patterned sweater, and the four people at the end of the bar, including the woman wearing the black hat, are all gone. (Curiously, the milkshake remains.) Heidi and Shelly, meanwhile, are now both behind the counter. The patrons watch as the man who rushed in leaves and runs around the building before they get back to their conversations. 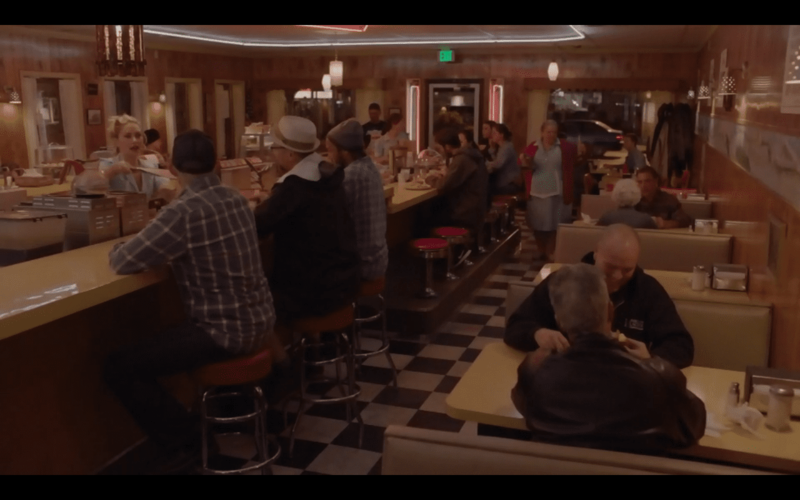 We visit Norma briefly once more before the final camera switch takes us back to the far right corner, and we see a fourth configuration of the diner: this time, Shelly is behind the counter, Heidi is taking orders on this side of the diner; the burly men have been replaced by the man in sweater with the beard again but he is sitting further down the bar where the two women were first sitting. The three men (two in plaid, one in black) remain in the foreground, but the patrons in the booths along the right hand side have changed; gone are the two men in black, having been replaced by another two men in a closer booth sharing coffee and an elderly woman and her table mate a few booths away. Most strangely? The man who was looking for Billy strolls into the diner, calm, cool, and collected, as if nothing were the matter. Four very similar but subtly different configurations of the “same” diner scene happening in very quick succession, so quick in fact that few people noticed it upon first viewing. Could this be an example of a multiverse in action? Are each one of these scenes representative of a branch that was created by a different outcome of the same choice? What was that choice that led to four slightly different Double Rs in one two minute section of The Return? Leaving those questions aside for a moment, let’s turn towards The Final Dossier. 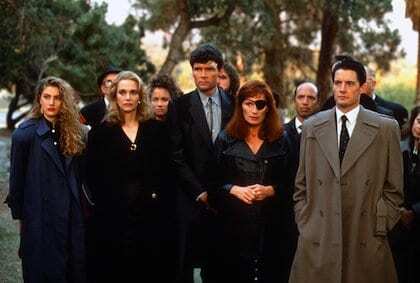 A straight up-and-down MW reading of The Return and its various parts can’t be the whole story. MW says that the parallel universes created at each split are independent of one another, and inhabitants of one universe are physically incapable of interacting with inhabitants of another. 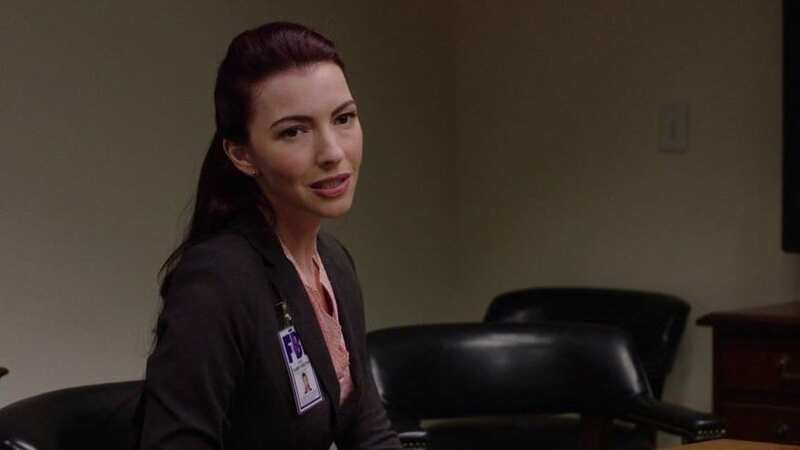 But we know from The Final Dossier that Tammy is able to remember a different version of the same history in which Laura was killed, while existing in a world in which Laura is a missing person and possibly still alive. Strictly speaking, how is this possible? Physics tells us that dark matter permeates all things all the time. We know it’s there for a variety of reasons, not the least of which is the fact that telescope interference proves that something is there. What that something has been named is dark matter, but what it actually is is still unknown. We believe currently that dark matter is what binds the universe together. What if the universe is bound together by other universes existing within the same general location in space time but dimensionally displaced? They don’t hit all the exact same spots, but many of them overlap, and as each one grows dissimilarly, all of them eventually fill the space, all the while growing further from each other in spacetime. This means that a universe which shares most of the same characteristics (which would traditionally mean the ones that are closest you the universe in which you reside, as the more decisions made, the more different each world becomes, infinitely) would share many of the same specific points in time, thus, generally inhabiting the same location in space time, with some minor differences. Dark matter, or something like it, could be in the space in between, something with mass and which exerts “gravitational force” (inasmuch as gravity actually exists in the realm of quantum mechanics) and, thus, something that—though we may not be able to now—we could interact with, and through, in order to “touch” parallel universes next to and around us. A ghost resonance, if you will. Could this be how Tammy is able to pick up on memories of an apparently alternate reality? Is this what happens when Albert and Gordon start remembering the Philadelphia Field Office visit from Phillip Jeffries? 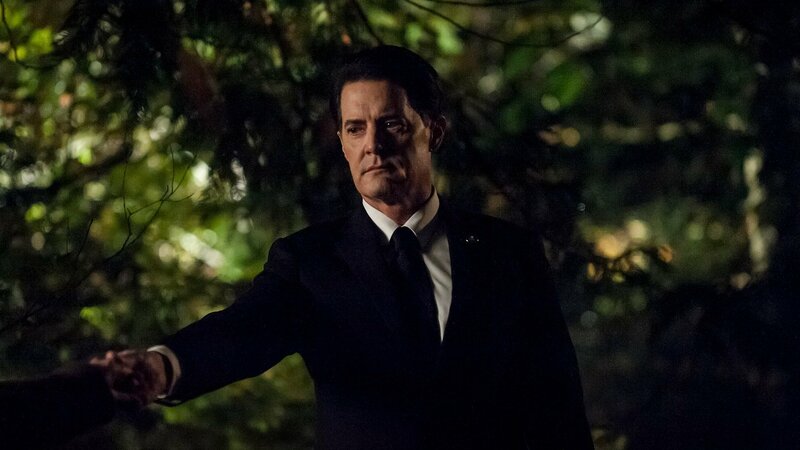 The Twin Peaks that we know is comprised of several potential worlds, but we’re only going to talk about the following two as they hold the most weight: the World where Laura dies, and the World where Laura doesn’t die. 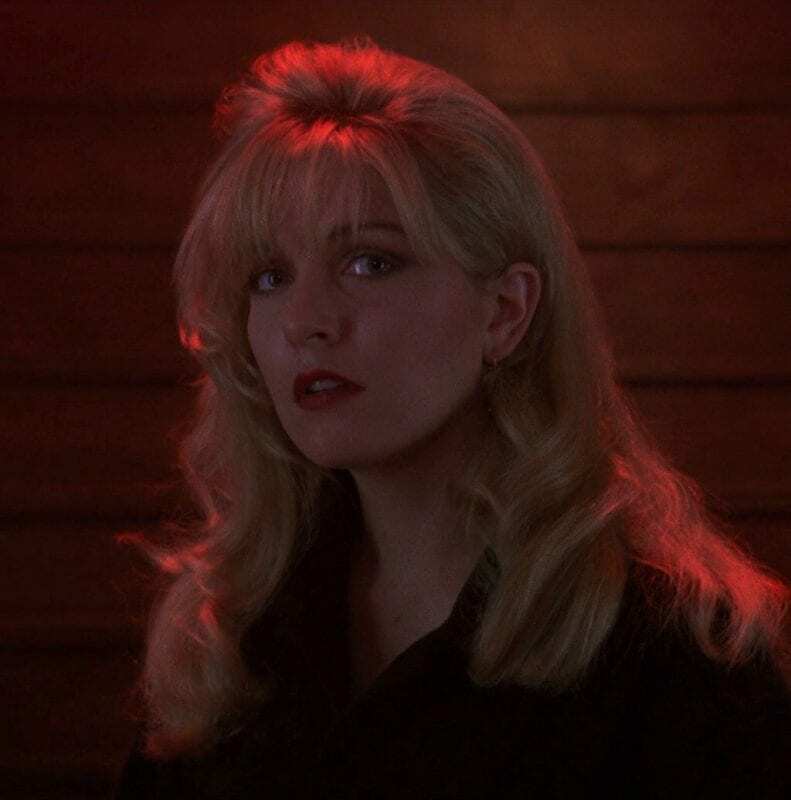 The World where Laura dies is represented in Seasons One, Two and in Fire Walk With Me, and for the purposes of keeping things straight, we’ll call this the ‘Prime’ world, though it is not necessarily the first world; it’s simply the world we first encountered. 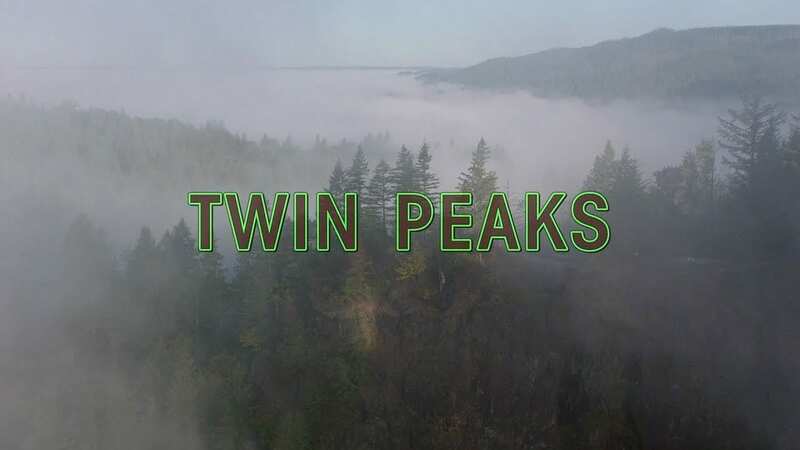 The World where Laura doesn’t die is represented by the Mark Frost books, The Secret History of Twin Peaks and The Final Dossier, as well as potentially other books released, but we’re just going to consider the two Mark Frost works in this theory. We will call this world the “Altered Prime”. 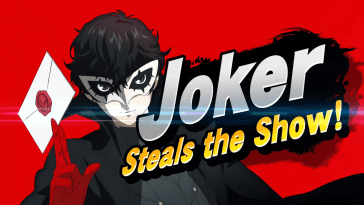 The Return, as you’ve probably noted, is missing from the above. A MW theory gives possible credence to the idea Mandela both died in prison and survived to become a world leader; it’s also entirely possible that there is a universe in which the books are titled Berenstein Bears and not Berenstain Bears, and so on and so forth. The fact that some of us exist in one universe while holding fast to the firm belief in “false” memories could be some kind of bleed through between these layers. Aided by dark matter? Until we know more about the glue that holds everything together, it’s as good an explanation as any. Instead of falling into one or the other world, it is the intersection of these worlds are particular points in spacetime which lead to this cross-convergence of conflicting information. The Return is the overlapping of these universes on their trajectory across space time. Certain events are so close that they share them, and others diverge. It is worth noting that the Mark Frost books are comprised of information from the Altered Prime, but are read by Tamara Preston during the intersection of both worlds, so Tammy’s viewpoint is from the Prime World. Inconsistencies within the book itself (which do also exist, such as those seen in Annie’s timeline and others) are the result of the same convergence happening with yet another world that exists in many of the same spacetime locations as the world represented by the Altered Prime, but not in enough of the Prime world for it to be included. These are our theories, and depending on the day and the time, we lean towards Copenhagen and back to Many Worlds in equal measure. Along with John Bernardy’s Timequake theory and the Bardo theory posited by many (including our own J.C. Hotchkiss in her three-part series) and others, they form the backbone of an increasingly dense and multi-faceted series of interpretations, all of which seem consistent and viable. Thanks for your articles. I understand quantum mechanics in a “popular” way; I do not understand it like you do. 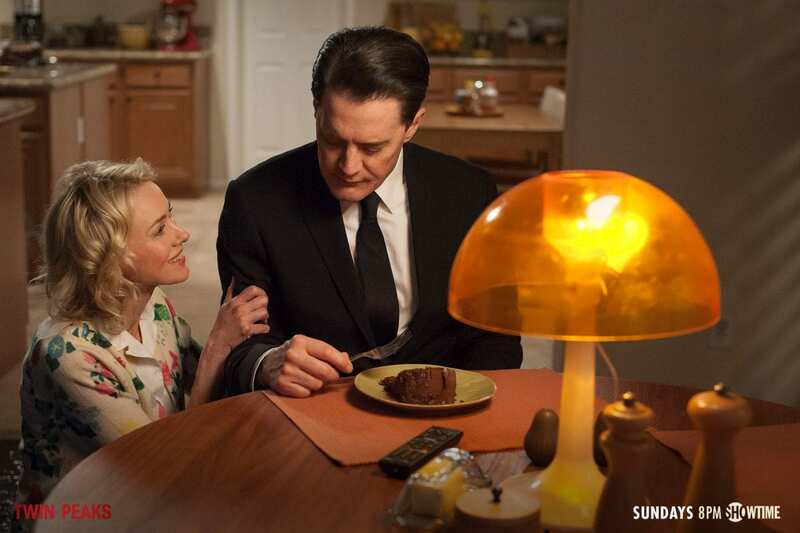 But as soon as I heard the phrases “quantum mechanics” and “Twin Peaks” used together, suddenly everything that happened in Twin Peaks made sense to me. Thanks again for your efforts to educate the public about physics. Thank you for reading, Linda! I’m really glad that our essays were helpful. Of course we don’t pretend that we’re experts but our jumping off point was simply a desire to explore these ideas and have a little fun — if we helped someone understand something a little more, then that’s a bonus! Did you watch the videos from PBS Space Time? I found them to be some of the best and most concise and relatable explanations I’ve ever seen for some of these difficult concepts! If you’re interested, they have a whole YouTube channel with tons of links and videos about these and so many other ideas!! Notes From The Bookhouse Babes – What Do We Do Now?!? 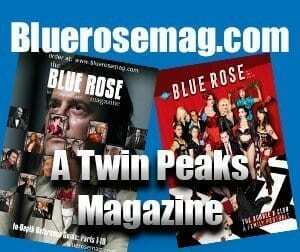 Notes from The Bookhouse Babes – What Twin Peaks Means To Me. 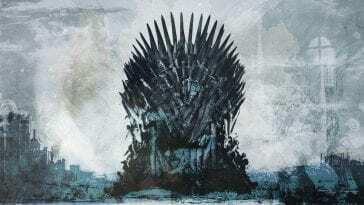 Notes from The Bookhouse Babes – Season 4? Notes from The Bookhouse Babes – Did I Ever Tell You About That Time I Met…?